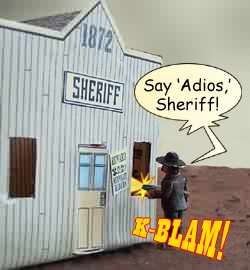 At its most basic level, Gutshot is a game where you put toy buildings on a table and move around little metal cowboys, pretending they are shooting at each other. It's a lot like playing "Cowboys and Indians" when you were a kid. Except now, of course, there are rules to govern how far figures move, how fast, what kind of guns they have, different kinds of horses, and all sortsa fun stuff like that. Rules are good. After all, it'd be pretty embarrassing if someone walked in on a group of grown men and women who were pointing their fingers at each other shouting, “Bang bang, you're dead!” “Am not!” “Are too!” The rules in this book will spare you from that fate, and open up for you a whole new world of Miniature Wargaming. In more advanced (and fun!) terms, Gutshot is a fast-paced, easy-to-learn game that has you slappin' leather and blowin' away the bad guys in a matter of minutes. 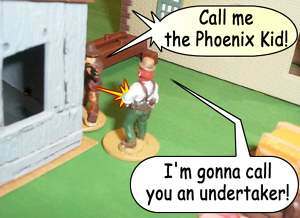 Using 25mm miniatures and some dice, this game is a simple system for running one-on-one and small-scale combat set in the American Wild West. By one-on-one, we mean that each miniature represents one person. There are no armies or mass combat here - everything stays up-close and personal. Using 25mm miniatures and some dice, Gutshot is a fast-paced, easy-to-learn game that has you slappin’ leather and blowin’ away the bad guys in a matter of minutes. At its core is a simple system for running one-on-one and small-scale combat set in the American Wild West. It is a fun game that is easy to learn and play; it combines realism, pulp fiction, and a little bit of “Hollywood” thrown in for good measure. Gutshot is a game that captures the spirit and mystique of the American Wild West as portrayed in movies, television, pulp novels, and comic books. It’s the American Wild West of youth and fantasy, not a detailed recreation of history. Gutshot has been in development since 1999. The first draft was written by Mike Murphy, who quickly brought his long-time friend, Mike Mitchell, into the fold. They soon brought friend Paul Mauer to help with development. The three have been hard at work crafting the game into a quality product that could be enjoyed by both novice and experienced miniatures gamers, and was officially released in Houston, Texas at OwlCon XXIV (the city's longest-running game convention) on Feb. 4, 2005. The Gutshot Core Rule Book is a 178-page soft-cover volume that contains all the rules, forms, and information you need to step into the boots of a Western gunfighter. For complete information, please see the product listing below. The game itself consists of the Gutshot Core Rule Book that includes the information, guidance, and forms you need to let your imaginations run wild. Most importantly, you need some friends. Gutshot is designed for 3-8 players, but add as many as you can squeeze around the table. That's one of the great things about gaming in general -- it's a social hobby and once you get a bunch of people around, you can't wait to get Gutshot on a regular basis! Gutshot presents a new, dynamic combat engine for running small-scale combat with 25mm-30mm miniatures. The book includes all rules, Character Sheets, Horse Record Sheets, Vehicle Record Sheets, a section with the most-commonly referenced tables and two Adventures: “Last Man Standing” and “Love & Bullets.” The book also features "Quick-Start Rules" so that experienced gamers can quickly get a grip on all the game basics. It is a square-bound soft-cover book with a full-color cover and a lavishly illustrated black & white interior. Retailers & Distributors, please visit our Retail Support Center for additional information and downloads. Not sure which version of the book you have? Check out the Printing History of the Gutshot Core Rule Book.